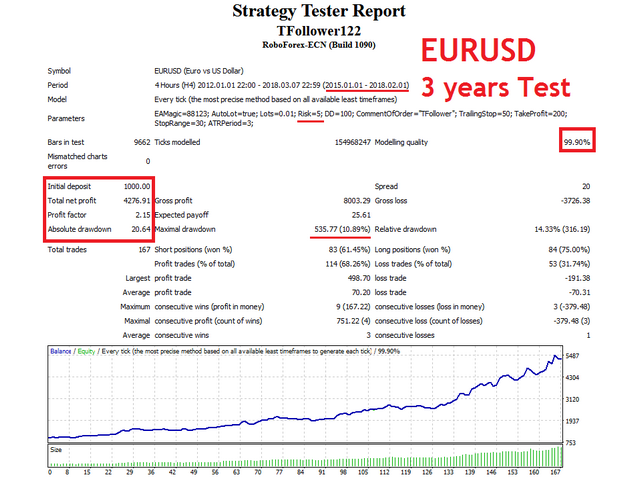 The TFollower Expert Advisor is a fully automated trading system that finds changes in the trend and opens medium-term positions in its direction. Minimal number of indicators and parameters are used in the EA, a lot of attention was payed to its universality. "Dangerous" strategies are NOT used. NOT sensitive to spread, execution speed or type of the trading account. Recommended minimum deposit - $100. EAMagic - EA's magic number. Must have different values for every chart. AutoLot - can be set to true or false. If true, the EA selects the lot size for trading depending on the balance value. Lots - lot size is set by a user, if the value of AutoLot is false. Risk - percentage of the deposit used for the automatic calculation of the lot. DD - maximum allowed drawdown. CommentOfOrder - comment to orders. Can take any value. TrailingStop - trailing stop in points. StopRange - distance from Moving Average with a period of 10 to set StopLoss, in points. HiddenStops - can be set to true or false. If true, the Stoploss and Takeprofit levels are hidden. ATRPeriod - period of the ATR indicator. QuotesMult -a multiplier for parameters TrailingStop, TakeProfit, StopRange for instruments with different number of decimal points (digits) in quotes. The default value is "10" - for trading on standard forex symbols of any broker who has 5 decimal points (digits) in the EURUSD price. If you work with a broker who has 4 decimal points (digits) in the EURUSD price, then the QuotesMult parameter must be set equal to "1". If you are an experienced trader and understand all features of trading on non-standard instruments, you need to choose the necessary value of this parameter by yourself, depending on the number of decimal points (digits) in the price of the symbol you need - 1-10-100-1000. ShowInfoPanel - can be set to true or false. If true, the information panel is shown on the chart. Panel_Language - language of the information panel. TextColor - font color of the information panel. Recommended parameters for several currency pairs are shown in the screenshots below and in description of the EA's signal. Default parameters are set as for 5-digits servers. If you need to work with a 4-digit server, set the QuotesMult parameter equal to "1". I will be happy to answer any questions you may have. Price of the Expert advisor will change every week proportionally to profitability of the signal Monitoring of trading on a real account . In case of growth of profitability - price of the Expert advisor will be increased. In case of reduction of profitability - price of the Expert advisor will be decreased. It has been months since I bought tFollower so I have a pretty much clear idea of what it is and how it works. As the name suggests, tFollower is an EA that tries to exploit medium-term trends on the market, trying to follow it as soon as it is possible. One thing that i absolutely like is the way it places the stop losses based on a dynamic range and volatility. This means you will see your stops always settled down in a proper way embracing, thus, the market movements in the right way. Usually, the SL/TP ratio is 1/3. 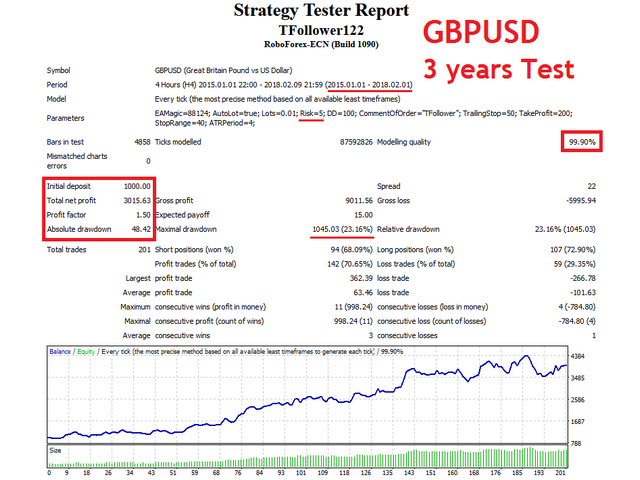 A fixed trailing-stop, morever, help to block your profit and gain till the market does not reverse or till the take profit. Personally, it would be nice to see also here a sort of "adaptive" trailing stop. Big question. Does it make a profit? As long as you will not go over the 5% of risk (3 pairs) yes, it will bring to you a troublefree growth in the long run. I would like to spend some words about Evgeniy Machok, the author. Evgeniy is a kind professional and helped me many times, after listened my concerns and ideas. He always assisted me (5 stars only for this). It's always present and you can count on him if you need assistance regading his products. Moreover, he seems very interested to listen new ideas that could improve the EA. As long as it will bring benefits for everyone, he will take it in serious consideration. If I have to say something that I do not like about tFollower, well, is the process of optimization. 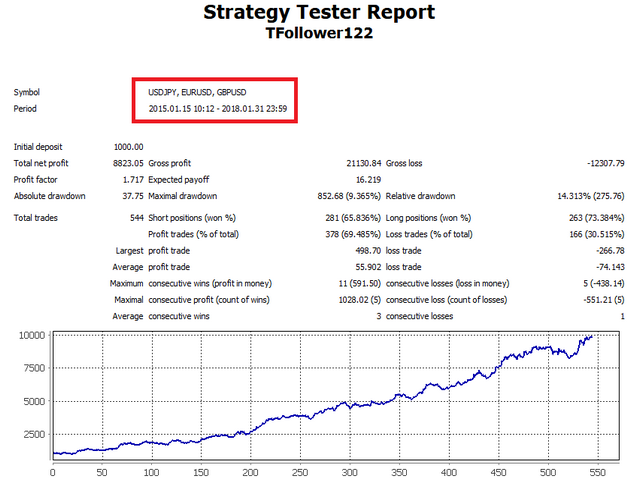 tfollower is ready to go for EURUSD, and the author already optimized it for GBPUSD and USDJPY. However, if you want to optimize it for other instruments it requires tons of time unless you do not have a kickass CPU. I usually use 10 years of real tick data and it takes me from 3 to 7 days. It highly depends on how broad your settings exploration is. So, as you can understand, creating a basket could take you much much time. After purchasing the full versions of YELLOW and SZ Scalper, I purchased TFOLLOWER. Code was optimized for new versions of MT4. Added a new parameter that allows hiding StopLoss and TakeProfit from the broker. Small fix of information panel. Code was optimized for slow servers. 1. Added the opportunity of trading on four-digit servers. 2. Improved market entry points.